Khazana Building Museum under the care of Department of Archaeology and Museums has its gates closed to public. Hyderabad: For more than seven years now, tourists at the iconic Golconda Fort have been deprived of a ‘treasure’ nearby. The Khazana Building Museum under the care of the Department of Archaeology and Museums has its gates closed to the public, while a handful of staff can be found busy cleaning its premises on a daily basis. Renovation work had been taken up in 2013, and after the expenditure of about Rs 48 lakh, the building was spruced up with re-plastered walls, beautified gardens and clean pathways. However, three of the four wells in this ancient open courtyard are still in a deplorable condition, while all the halls and rooms inside remain locked. The 15 rooms and two halls here, which used to house treasures in Ibrahim Qutub Shah’s reign during the 16th century, are not opened even for cleaning purposes. Several ancient sculptures can be seen placed firmly on pedestals adjacent to the rooms here, while two large canons lay half-buried in the gardens. 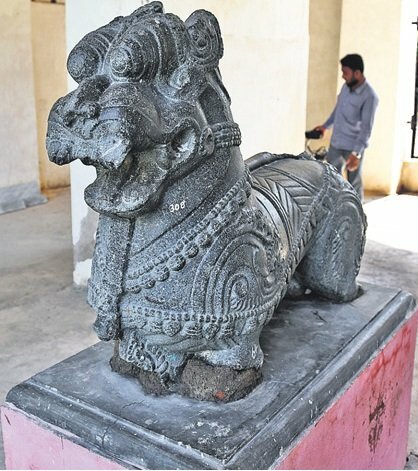 A magnificent Nandi sculpture in decent condition stands out as it is placed prominently in the middle of the narrow passageway, while the old office of the building is locked up and is largely covered in dust. In the gardens are dozens of neem, jackfruit and plum trees providing thick shade, but there are no benches or chairs here. 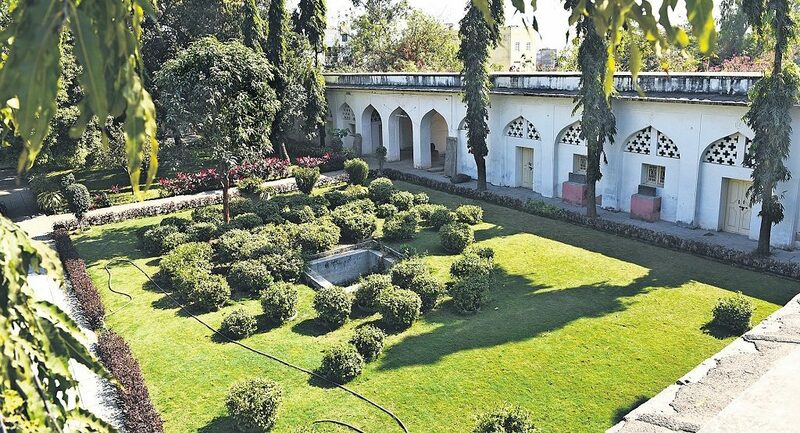 City historian and retired assistant director of Archaeology and Museums Department MA Qayoom told Telangana Today that the building, which is the city’s oldest courtyard, is not a museum anymore, with most ‘treasures’ of importance having been moved out of the premises to safer museums under the department. 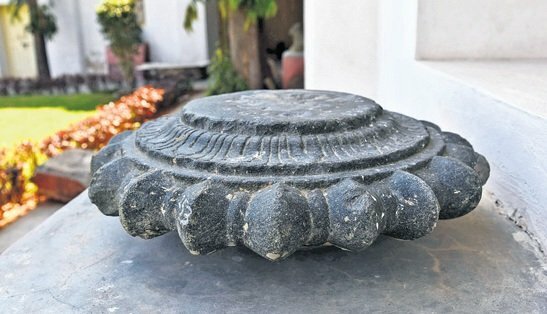 “However, there still are many sculptures and stone inscriptions in the building which date back to the Qutub Shahi, Chalukya, Bahmani and Kakatiya dynasties,” he said. The building has two large halls on either sides of its main arch at the entrance which were used to be the main storerooms for coins, arms and other ‘treasury’ material of the Ibrahim Qutub Shah regime. In 1590, as the capital of the dynasty was shifted to Hyderabad, it was emptied of its treasures as was the Golconda Fort. “It was later under the care of the Indian Military but soon it passed hands to the department, which treated it as a museum,” said Qayoom. The current condition of the heritage building is relatively new for the residents of the Golconda neighbourhoods. Many of them are here through generations of residence in areas such as Langar Houz, Bada Bazar and Rethi Galli. For those who lived here in the second half of the 20th century, the Khazana Building Museum was a neighbourhood leisure spot. “We used to come here with large family groups and take tours of the place even though we had seen it many times. Since the artefacts here were of ancient origins, we would enquire about them and the guides would entertain us. Now, sadly, years have gone by and we are not allowed to enter, even though the renovation work was completed some time in 2015,” said Sheikh Imran, a resident of Bada Bazar. “Thousands come to the Golconda Fort every day. If the Khazana Building Museum is thrown open to the public and promoted well, it could easily attract hundreds of visitors, since it is at a walking distance from the fort,” said Syed Moinuddin, another resident of the locality. Officials within the department, on condition of anonymity, admitted that there are no plans to re-open the Khazana Building Museum. “The renovation work was never completed. Funds ran out and a lot of cleaning work was still pending, so the department said the renovation is complete. The reality is that the renovation needs to be restarted and funds need to be allotted for the same,” said a senior official. Another manifestation of the ostensible fund crunch here is the complete lack of trained staff. If one manages to get inside the Khazana Building Museum, one is greeted by men who have no clue about the heritage of the building, except for that it belongs to the Qutub Shahi dynasty. The language of the ancient inscriptions, the eras of the sculptures, the number of rooms and artefacts, the sizes of the sculptures and the kinds of trees are all fresh questions to the attenders. The visitors will have to do their own homework on this ‘Khazana’. Indian National Trust for Art and Cultural Heritage (INTACH) city co-convenor P Anuradha Reddy said the department must not deprive tourists of a valuable museum and heritage site this way. “Trained staff, ticket counters, proper washrooms and uniformed security and CCTVs must be brought in at the Khazana Building Museum, since it deserves to have a good tourist footfall. It used to be such a beautiful place in the decades gone by,” she said.